A new regional passenger train in Italy. 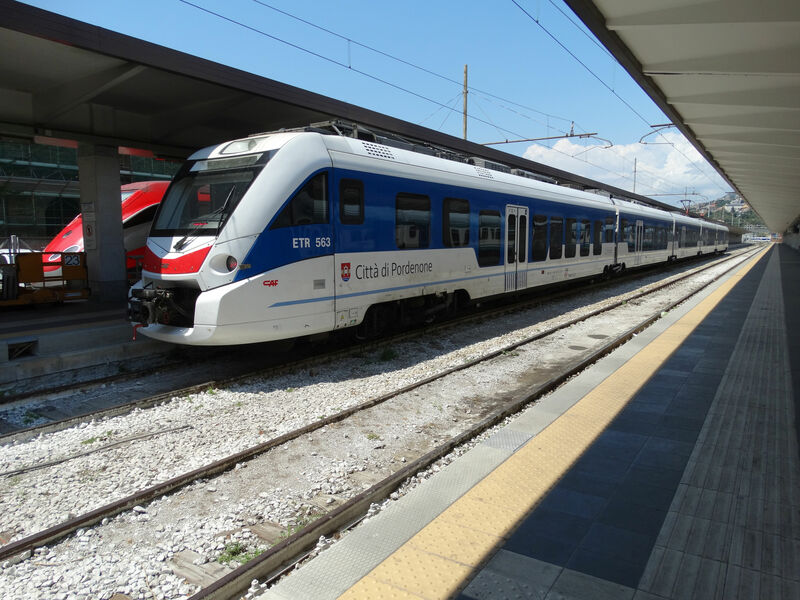 This is a Civity series train built by CAF in Spain and paid and owned by the Friuli-Giulia-Venezia region of Italy and operated by FS Trenitalia, Italian state railways. A total of 12 trains operates now for the Friuli-Giulia-Venezia region. 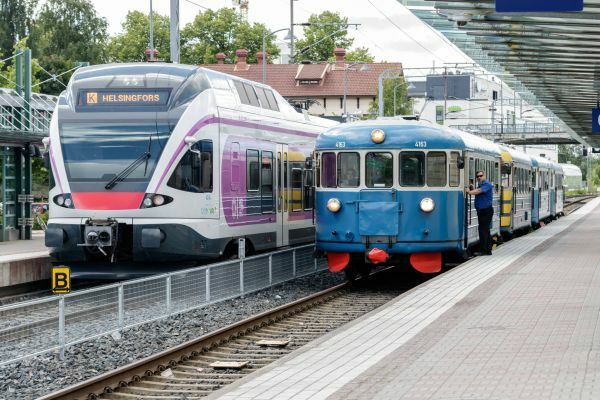 Some of them are classed as ETR563 for operations only in Italy and some, called ETR564, can even cross the border into Slovenia and Austria using their different electric systems. Picture from Trieste main station 12.7.2018 by Ilkka Siissalo. This FUNET railway pictures archive is one of the oldest online sources of train and tram related photos. Its story began roughly at the same time as that of the www. In the meantime, several other good quality train picture sites have emerged, and for about a decade nothing happened here. Since 2016 we are now trying to make a revamp and start publishing here much more pictures than previously were available. The site got a new name, railpics.club, but the old and existing URL address http://www.nic.funet.fi/pub/pics/railways works nevertheless as well and leads you here. This site is now maintained by members of a Finnish railways enthusiasts club, Alppirautatieharrastajat ry, or Friends of the Alpine Railways, together with some other voluntary railway hobbyists we got to know over Facebook. We want to express our gratitude to the Finnish academic network FUNET and FUNET's parent organisation CSC, for kindly providing us with the necessary server space. What is the difference between this site and most of the other railways pictures sites? Firstly, the pictures are published "as is", that is, we have not done much photoshopping. Probably you can improve many of the photos if you have time and good photoshop skills. Newer pictures are also provided in a large format, "full size", whereas most other sites limit the resolution of pictures to a very small size to conserve disk space. All the material you can find here, you are welcome to use in any way you like, (with the exception of company copyrighted pictures specifically marked), but obviously it would be nice if you would mention the original photographer's name if you republish the material. And if you print any of these pictures for example in a magazine, the photographers would be delighted if you could post them a paper copy or pdf copy of your publication where the picture appeared. For this purpose you'll find the address and contact details of the chief admin at the top left of this front page. It's always nice to see one's own photos being used in a meaningful and useful way. Please note that in all categories you can always get the full size picture by clicking on the thumbnail pictures !! 22.4.2019 Added a new category for Bolivia and some new pictures from Finland. 19.3.2019 Added new pictures from Italy. 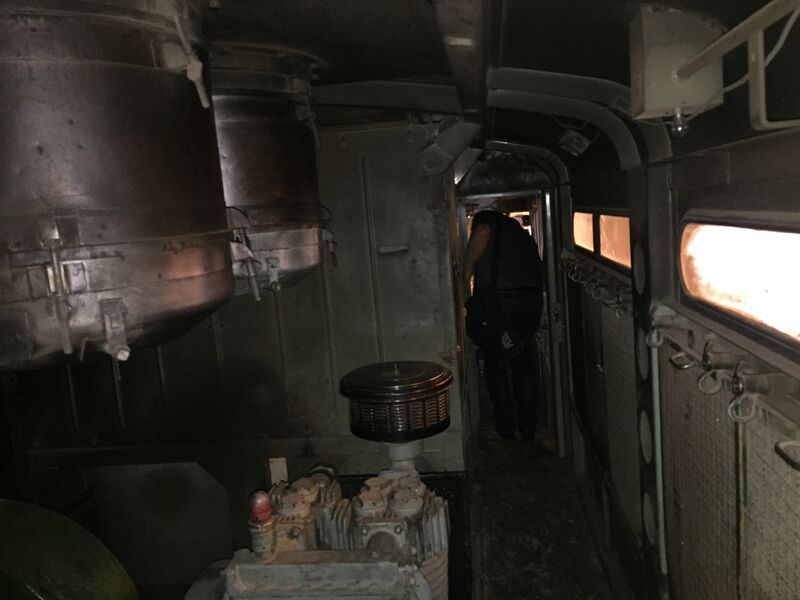 3.3.2019 Added a lot more pictures into the category Switzerland > Zentralbahn and also some to the categories Russia > electric and Russia > diesel. 19.-21.2.2019 Started redesigning and modernising the section Switzerland. 17.2.2019 Added more pictures from Italy. 30.1.2019 Added a lot of new pictures from Greece. 29.1.2019 Added a lot of pictures from Hungary plus some tram pictures of Italy and two locomotive pictures from Finland and two from Czech Rep.
27.1.2019 Added new pictures from Czech Republic and Germany. 26.1.2019 Added new pictures from Thailand, Italy and Germany. 24.1.2019 Added a new category for New Zealand and published new pictures from Germany, Belgium and New Zealand. 8.1.2018 Continued adding photos from Germany. 6.1.2019 Added a new page describing the Rügensche Bäderbahn, a 750mm gauge line in Germany. 5.1.2019 Added new photos from Germany. 25.12.2018 Added some new pictures in the category Czech Republic > Cargo. Added also new pictures from Germany and Austria. 19.12.2018 Added new pictures from The Netherlands. 18.12.2018 Added one picture from Finland, of very old coaches, and one of Czech Republic, of a brand new locomotive. 14.12.2018 Added new pictures from Poland. 30.11.2018 Added new pictures from Russia taken by Markku Salo. 23.11.2018 Added a lot more pictures from Spain. 17.11.2018 Added new pictures of a historic Dm7 "lättähattu" (flat hat) train from Porvoo, Finland. Added also a lot of new pictures from Spain. Two FCA six axle diesel locomotives at the Oruro depot. The one on the left is no.1014 which is from the newer batch of Hitachi-Mitsubishi locomotives no.1008-1023 from 1978, and the almost - but not quite - identical one on the right is from the Hitachi-Mitsubishi batch of machines no.951-970 from the year 1968. Picture from the Oruro depot in Bolivia by Pekka Ihalainen 2.4.2018. 1950s and 2017 trains meeting. The new one is a Swiss made Stadler FLIRT and the old one is a 1950s class Dm7 railbus. Both have in turn been running the route Helsinki - Kerava. Picture from Kerava station in Finland 22.7.2017 by Otto Eemil Juntunen.